I am thinking ahead to holiday gatherings and testing a bunch of starters, sides, and small indulgences for the season. A gourmet holiday meal or party need not bust your gut. You don’t have to add extra butter, sugar, and heavy cream to make food delicious. First case in point – Brussels Sprouts with Walnuts and Dried Cranberries. This festive dish offers a nice, quick alternative to the typical roasting of Brussels sprouts. It’s sweet, crunchy, savory, and would make a nice addition to any holiday table. Mmmmm – brussels. I thought I hated them until my hubby made them for me – steamed and then sauted with a bit of bacon to cut down on the bitterness. Great idea on the walnuts and cranberries – they’ll do the trick too with less fat. Ohh, yes! We had these little guys for Thanksgiving dinner (along with Turkey a la Yummy. 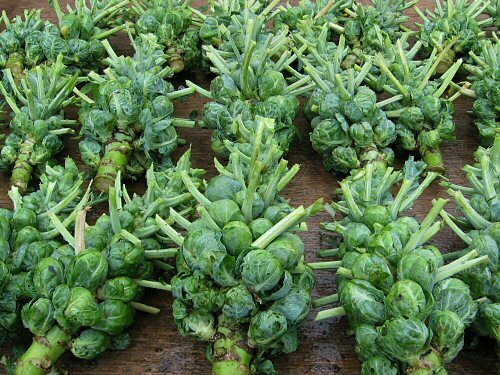 What a great thing to do to Brussels sprouts–a completely different veggie than the plain ordinary old traditional steamed ones (which are OK). Tonight we’re getting ready for a left-over dinner, and I was disappointed to hear “No leftover B.sprouts!” Leftover everything else, but the Martian Brains are history–we’ll just have to do more!